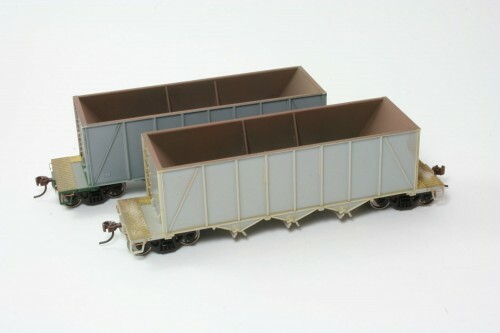 This weekend I had the chance to do some basic painting on this pair of hoppers and start some of the initial weathering of the cars. I gave the two cars an initial spray of weathered black for the basic body colour a while back, and now I had a chance to do the next step. First, I painted the interiors. To get the initial base colour for the interior, I actually used four different colours, lightly blending the colours up the sides with the airbrush. 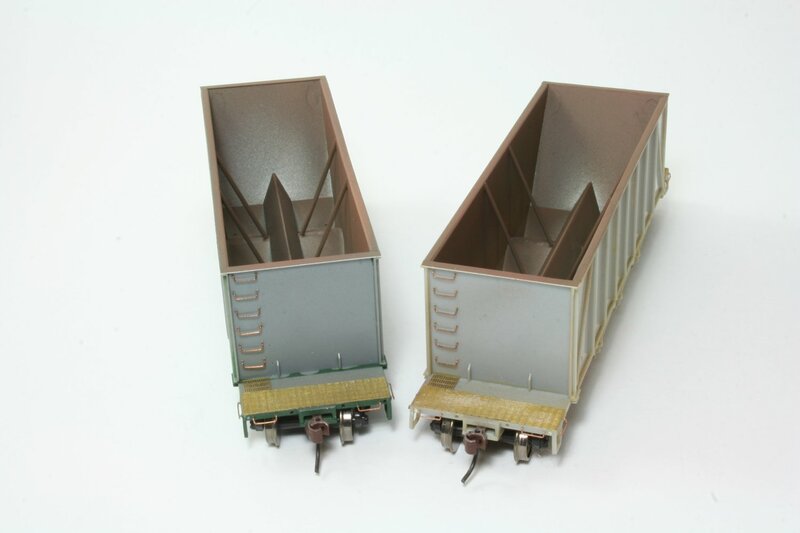 First I sprayed the lowest parts of the interior a metallic silver colour (Model Master “Steel”), then working up the sides with Gun Metal, Rail Brown and Rust, lightly blending each colour together so the the colour gradually transitions from a bare metal appearance on the centre sill and lower parts of the bays (where the load flowing out of the car during dumping would have the effect of “polishing” some of the rust off) to a more oxidized appearance on the sides and further up the hopper bays where less material is moving around during loading and unloading. This will likely be supplemented yet with a little bit of powders or pan pastels, but I’m liking the effect so far. 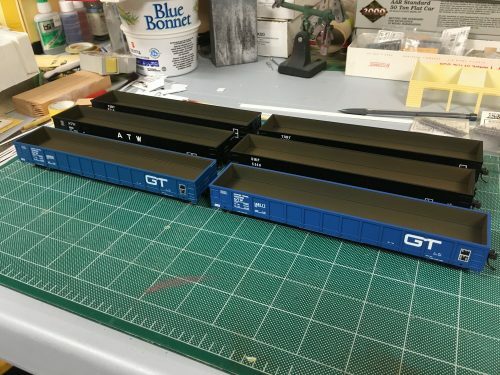 The next major step is weathering the exterior bodies of the cars. 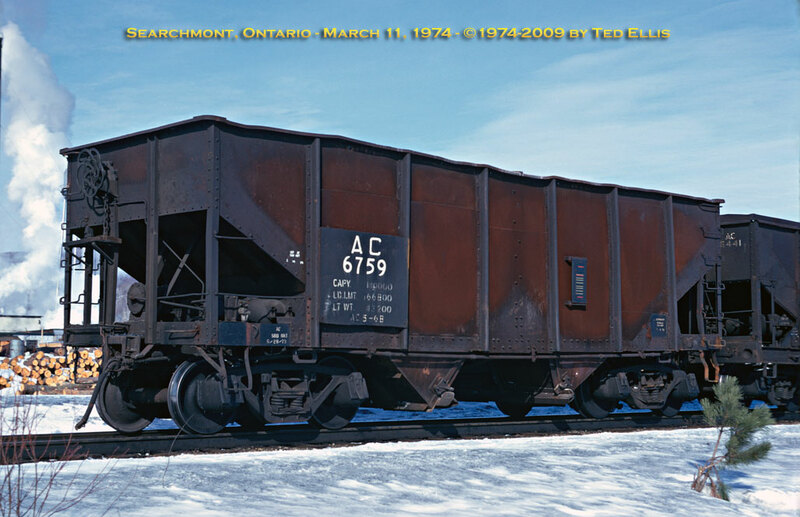 Most of these old cars on the ACR had a pretty distinctive weathering pattern caused by an older practice of loading sinter into the cars while still hot, resulting in much of the paint on the side sheets burning off over the years causing the sides of the cars to essentially become an expanse of rusted metal, following the shape of the interior bays. Check out this early 1970s prototype photo from Ted Ellis to see what I mean. To begin replicating this pattern, I used a somewhat experimental technique. I masked off the sides and spayed them a mix of roof brown and dark rust. 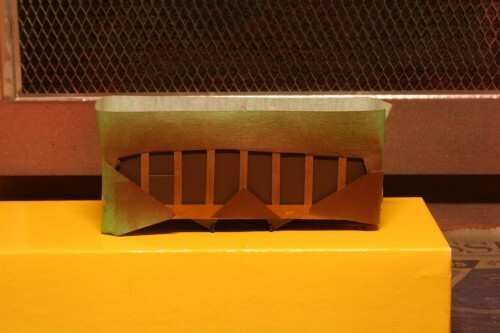 I first covered the ribs with strips of masking tape, as the burning effect of course only effected the sheet metal of the side sheets with which the hot material had direct contact. Then the bottom and side sills were also masked, and then the rest of the sides roughly masked in the shape of the load inside. The key here while masking is to deliberately NOT be too precise with it. Most importantly, prevent the masking tape from actually laying down on the sides of the car. The ribs were covered with a strip of tape wide enough to completely cover the rib, but these were not folded down over the shape of the ribs. The side mask was just laid down on the tops of the ribs and deliberately prevented from touching the surface of the side. My goal here was a nice soft edge that is NOT clearly defined when the rust colour is airbrushed. 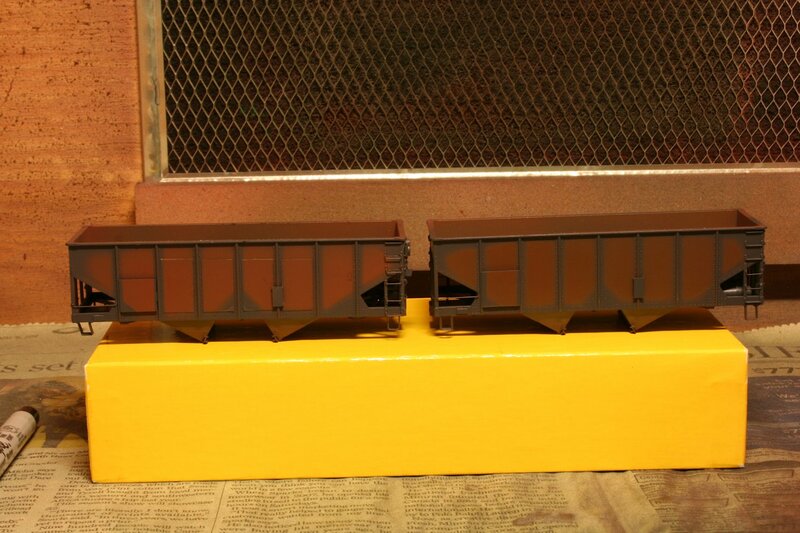 The masking thus completely, the sides were sprayed with a dark rust colour and the masking then removed. You can see the preliminary result above; so far, so good, I think. I have a ways to go yet with blending in darker colours with pan pastels to really make it look like rust. Eventually the raised panel at the left hand side car number and date will a shot of black before adding lettering. This weekend I got back to working on a couple of assorted modeling projects that I’ve had on the workbench for a while. One of these is this trio of 40′ wood boxcars. 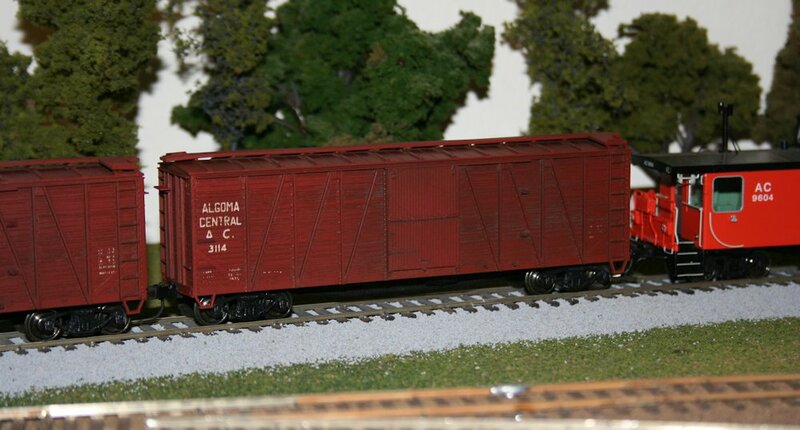 These three cars were modelled using Accurail’s 40′ wood boxcar kit with wooden doors and ends. This kit is a pretty close match to the AC cars; they might not be 100% dead-on – I note some minor differences in the horizontal metal straping at the top of the vertical end braces, and the doors stops are located differently, but the side bracing looks pretty much the same – it’s close enough for me. 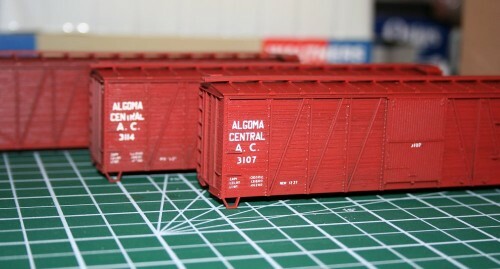 I chose not to do a lot of fine detailing on these cars; while Accurail’s details (i.e. 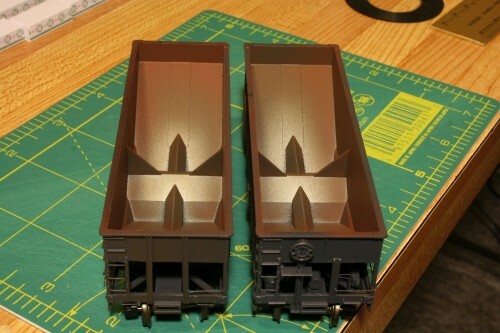 grab irons and ladders) are molded onto the car body and not separately applied freestanding pieces, Accurail’s tooling is fairly well rendered, and on the wood car it’s not really bothering me that much. If it was a steel car, I’d probably upgrade the detail. Might seem a bit quirky, but in this case I can accept the level of detail of the car body. The shells were actually painted quite some time ago; these were some of the first things I painted while practicing with my new airbrush. I sprayed the shells with CN Mineral Brown from TrueLine Trains; really any shade of generic “boxcar red”/freight car brown will do here. Lettering is from a rub-on “dry transfer” lettering set from CDS Lettering. Following photographs, I deviated from the lettering set a little. The set includes horizontal lines above above and below the reporting marks (initials) and numbers. While when new these cars would have included those in their original lettering, all photographs from later years around the 1960s-80s show these cars without these lines. As I’m modeling this later period, these lines were excluded, and the reporting marks and numberes were moved up a bit, to put the reporting marks and number around the upper grab iron on the left side. Once all three cars were lettered, I weathered them up with Bragdon weathering powders applied with a stiff brush. 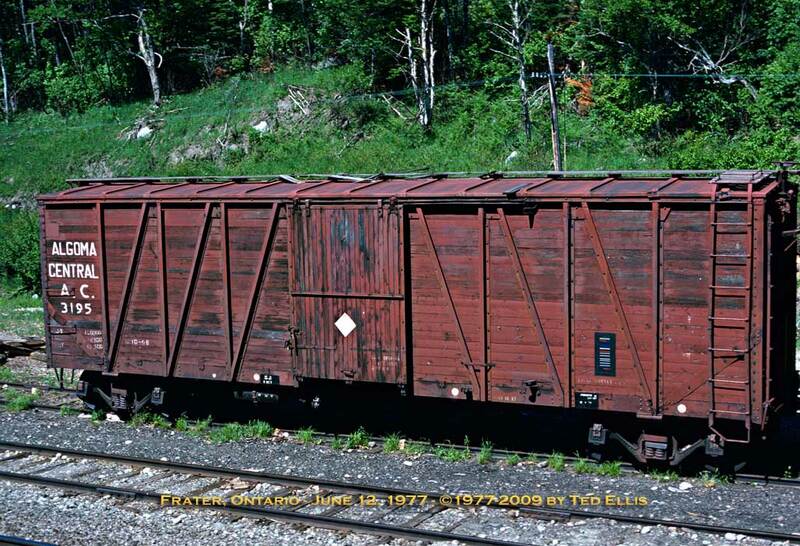 I kept mostly to the darker browns – burnt umber and burnt sienna – as these are wood cars I avoided the oranger rusty colours. I also used a bit of black (soot) on the roof to darken it and accent the roof ribs; and also on the sides to darken and bring out the board detail of the sides. 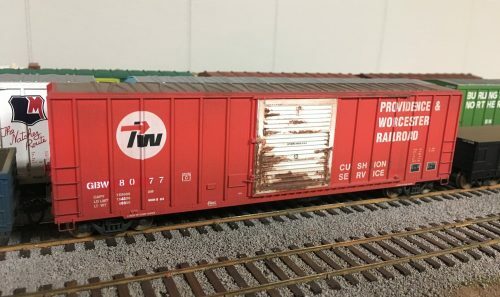 The Accurail car has a lot of grain molded into the sides and accenting this really gives the car a more worn appearance. I also tried concentrated the darked colours around the door opening and the end of the door track where rain would tend to wash off the car roof to try to make these areas a bit darker and more weather-worn. This wasn’t precision detailing, and it spreads out a lot by working it with the brush, and the effects of the powders are actually very subtle, but I think it did generally work to darken the general area just a bit. It’s not necessarily really consciously noticeable that those areas specifically have been darkened, but it brings out the details and the wood grain of the sides, and darkens and varies the colour of the car a bit. And on a couple of the cars even from a distance (maybe even more from a distance) the door and right side of the car is slightly darker in colour than the left side where the majority of the lettering is. There’s a few details to be done yet, and the underframe needs some minor detailing and then the frame, trucks and wheels all need to be painted/weathered. The completed car will probably get some additional road weathering along the bottom at that time yet as well, but that’s another day.